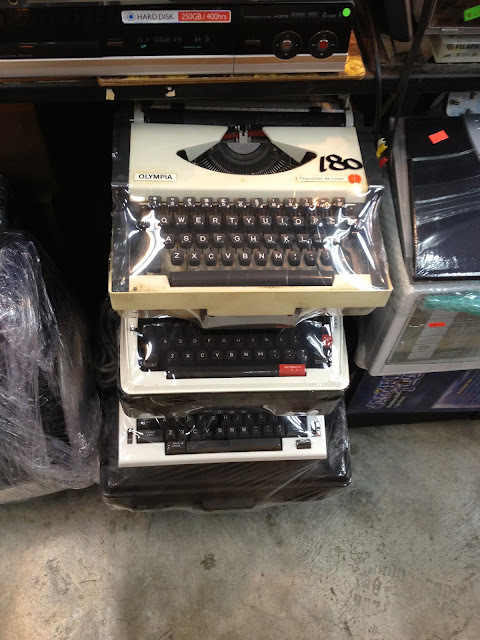 I stopped briefly on Apilu St. in Kowloon, Hong Kong today, and found a few typewriters to my surprise. I was only able to sneak this one photo, but there were about five. Most were Olympias, shrinkwrapped as if they were new. There were a few brands I never heard of but I wasn't able to get more info. I will have to revisit again when I have more time and investigate. How intriguing! They might be new, or maybe they shrink wrap everything they sell at this place (the neighboring items are well-wrapped in plastic). Keep us posted. This is the only store I know in HKG that sells used stuff, and yes, they were shrink wrapping everything. The top one was definitely used, but the ones below maybe new Chinese ones which is why I didn't pay much attention to them originally. But will need to revisit the store and spend more than a few minutes there. Shrink-wrapping does create the illusion that the object is new -- interesting. For typewriters, it's a way of keeping prospective buyers from testing the machines. Clever! I was in HK last December, in Kowloon in fact, can't believed I missed this! Do you have the shop's name and address? Thanks. The store number is 253, listed in my Dec 5, 2012 posting which may have more info (at least more photos). Hi , I'm a very late viewer , I also looking for a typewriter like Remington ， it seems impossible to have one unless buy it online , but may I know where you guys found these typewriter ? Thanks a lot !